This HiRISE image ( PSP_003540_1735 ) shows various interesting structures along the floor of Candor Chasma, a major canyon of Valles Marineris. 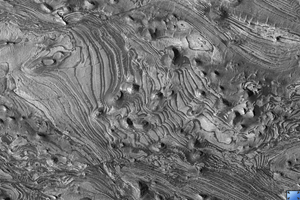 The rocks along the floor of the chasma consist of multiple layers of light-toned material, possibly windblown or water-lain sediment. These layers have been shifted along faults and also folded, giving the layers an apparent wavy appearance as they are exposed at the surface through erosion. Some waviness in the layers may also have formed as these sediments were laid down, for example, in dunes or large ripples. Detailed mapping of these faults and folds may help reveal the origin of these layered deposits and if water played any role in their formation.